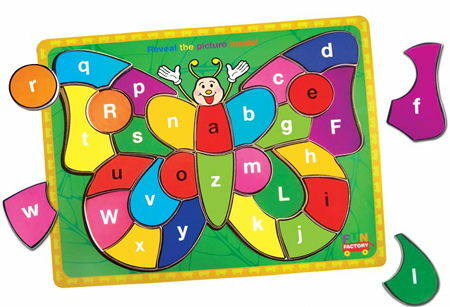 Wooden Butterfly Alphabet Puzzle is an ideal way to learn about letters, colours and the alphabet. This puzzle has twenty six pieces, one for each letter of the alphabet. Each piece has a lower-case letter on it and when you remove a piece the corresponding upper-case letter is printed below. This puzzle can be done by matching colours, shapes or letters so there are plenty of clues and different ways of learning catered for. Material: Wood with wipe clean gloss surface. We like this because: "It's bright colourful and really helps to learn those letters whilst having fun. "